Historically couples married in the ancient tradition of a 'marriage by declaration' or 'handfasting' ceremony, which was law in Scotland until as recently as 1940. This simple civil ceremony enabled couples to marry by declaring in front of two witnesses their wish to be husband and wife and they were legally bound. 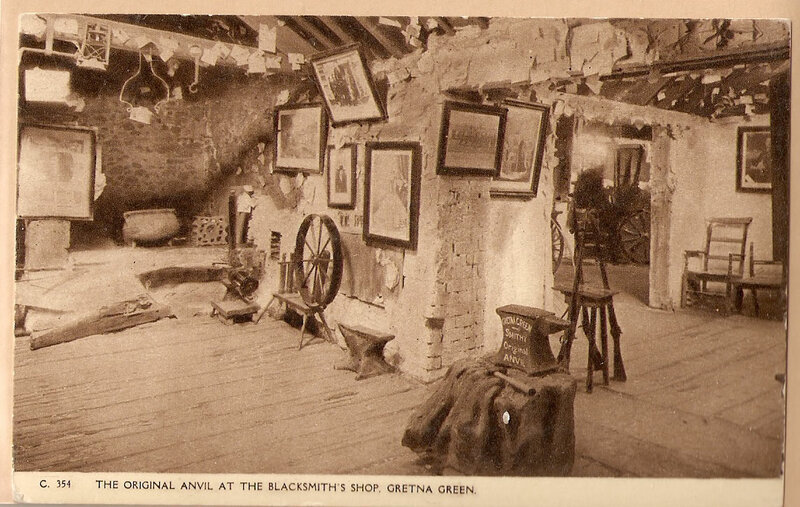 Gretna Green became famous for these ceremonies following the 1754 Marriage Act, which outlawed clandestine marriages in England. Lord Hardwicke, the English law lord who introduced this law, was determined to quash the desires of young couples from becoming husband and wife through this 'quickie' ceremony. His law introduced an age of consent at 21 and couples were required to marry within a church. He and his fellow parliamentarians at Westminster, fearful their own daughters (and their fortunes) would end up in the wrong hands, were quick to make the Act law. Scotland refused to adopt this law and once couples discovered this loophole they, in turn, were quick to take advantage and eloped to marry over the border. 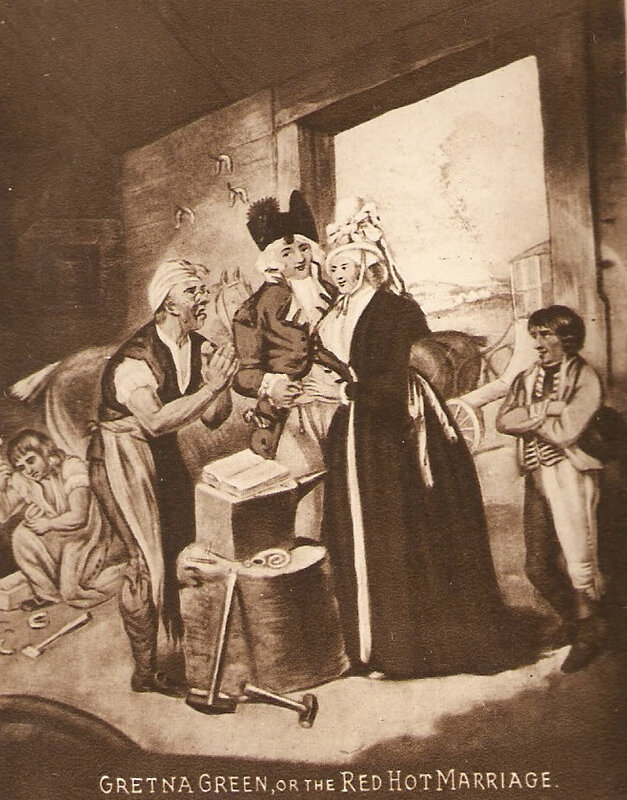 Just over the Scottish border, Gretna Green soon became a haven for fleeing couples who married wherever they could find two witnesses to make their ceremony legal. At the Blacksmiths Shop, the canny blacksmith soon downed his tools and took up the role of 'Blacksmith Priest'. 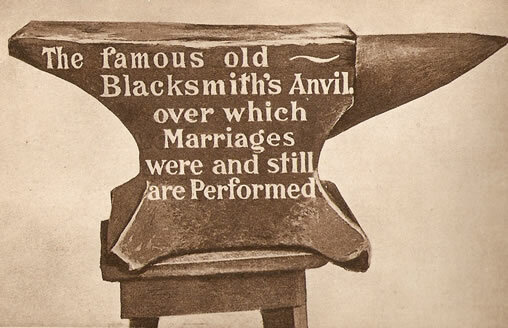 For nearly 200 years the blacksmiths at Gretna Green continued to marry couples over the now famous Marriage Anvil. To seal the marriage he would bring down his hammer upon the anvil (the tools of his trade). The ringing sound heard throughout the village would signify that another couple had been joined in marriage. Nowadays Gretna Green is fondly recognised worldwide and the famous anvil is the iconic symbol of romance; an enduring symbol of Gretna Green weddings without which a ceremony would be incomplete. Legend has it that by touching the famous anvil good fortune in the affairs of the heart will be yours.